…what? You expected me to have mentally stable friends? In any case, to avoid the pitiable plight of the wretched bald bunny this weekend, you should hop on over to the Cabaret, which really warms up quick with the addition of a few dozen people’s body heat. You’ll forget it’s winter! Unless you, you know, look outside. Plus we’ll be serving hot coffee, and possibly hot cider. It’s really past hot cider season, but we had some last time, so we served it in proud defiance of the secret agents of the Cider Police. We’re edgy like that. Anne and Kate Johnson Anne and Kate Johnson, The Mountain Mammas, will share the old-time music they have grown to love. While Anne and Kate have settled far from Appalachia physically, their hearts and voices will always be West Virginian. Brought up by the rivers and mountains they love to sing about, the sisters began singing in church and evolved into a harmonizing duo, playing original and traditional music anywhere from coffee shops to campfires. Although Anne and Kate are both songwriters, they enjoy singing old-time mountain music the most, and consider their Mountain Mamma act a tribute to their family and friends back home in the hills. Confession: I don’t have a lot of detail available, so I don’t know what to expect from this show. Other than that it will rock, becasue Mahmoud Hakima is as talented an actor as you could hope to find. Brace yourselves for the awesome. The Vibrant Ideal is a group of energetic young adults who have formed together under the direction of Fringe-Encore Winner, John-Mark Hostetler, to perform cabaret style dance and vocal numbers. Between the ages of 18 and 21, The Vibrant Ideal are bringing the Minneapolis community a fresh new way to look at musical performance. The choreography is hip-hop uniquely infused with modern and enough energy to bring down the house. 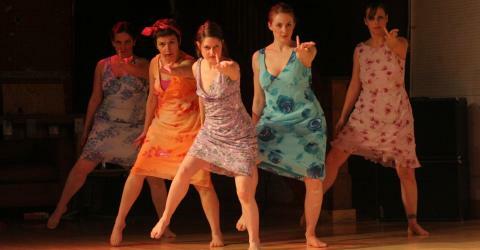 All performers are pursuing a dance or vocal performance major at the University of Minnesota. This original dance/dance theater work was created in collaboration with the cast of five dancers and the choreographer, based on their own experiences and how they interact as humans, and not necessarily artists, during rehearsals. All involved are current dance majors at the University of Minnesota. The piece is inspired by the human quality of forgetfulness. Every day, it is inevitable that someone will forget something- whether it is their paper for a class, an anniversary, to pick up the kids from school, to turn off the burner, to lock the front door, or to put on their pants in the morning. Sometimes those moments are easily fixed, and at other times they are not easy to ignore. How do the dancers deal with the many faces of forgetfulness, and more importantly, how do they deal with each other’s mistakes? Sometimes, the best that anyone can do is laugh it off and move on. Uh-Oh, Myrtle has gotten lost again. Everybody’s favorite 85 year old gal has lost her way in the big wide world. While out on her way to meet her heavy set friend Mavis for coffee Myrtle Hansen’s Chevy takes a wrong turn and winds up at Patrick’s Cabaret, in the wrong side of town While wandering through the joint Myrtle shares tales of why she NEVER trusts doctors, why the bread at communion should be changed to Wonder Bread, why Mavis has been under observation for her corns and how her lawn got on fire. WHEW. Bless her heart this woman needs someone to get up and let her sit down and rest a spell. Todd Jay created the character of Myrtle after years of stifling repressed laughter listening to his grandmother talk as well as countless other weird funny old women that have crossed his path. Let’s face it……..old women are funny and in their own way, charming. singer/songwriter/recluse/patron saint of jilted trophy wives, has been called the “Tammy Wynette of emo” for lack of a decent genre/category. clever wit over rustic guitar and an accent that no one can quite place run rampant throughout each hymn for broken things. Mattson-Kjell is currently finishing over 12 dozen new songs in hopes to release 3-4 new albums within in the next two years. He’s also really bad at writing about himself due to his crazy-swedish humility. Also, in case you were wondering, the latest Fresh Fruit appearance went off great. I’m really enjoying this opportunity to bring more people news of the happenings here at the Cabaret. If you didn’t catch it, you can listen online at http://www.kfai.org/node/89.